As a parent, I can tell you firsthand that kids don't do what you say. They do what you do. It may be an adage, but adages become adages because the truth can only be hammered so many times before the words like fossils are cast in stone. Our adolescent heroine in First Aid for Fairies is Helen; and although she's not sweating over adages, she personifies this to a certain degree. First, Helen is not your ordinary little girl (if there is such a thing as ordinary.) Helen is a violinist, a student, and the daughter of a veterinarian. We learn that Helen's mother would like Helen to follow in her footsteps; instead, Helen wants to follow her great talent and her first love, which is music. But life throws her a complication when she is approached by an injured centaur named Yann who was bitten by some creature whose teeth she finds. Yann has a wound that must be treated, and Helen treats it. And then she is drawn in to his quest when he returns to collect the teeth which belong to an evil creature. Her new friends include Lavender the fairy, Rona the selkie, Sapphire the dragon and Yann's best friend, a phoenix named Catesby. Helen's path is not an easy one. She must prove herself at every step, not only to her friends but to herself. As the healer's child, she becomes the healer for the little entourage. Helen grows in confidence, and makes careful choices, often having to weigh options which are not always black and white. There's an interesting twist as well—because these magical kids are trying to straighten up a mess they made. Helen is not the only one who has to prove herself. To join the magical creatures' secret quest, she must take items from her mother's medical practice, sneak out, keep secrets from her family, and allow her parents to believe the worst of her baby sister. First Aid for Fairies is appealing on a number of levels. 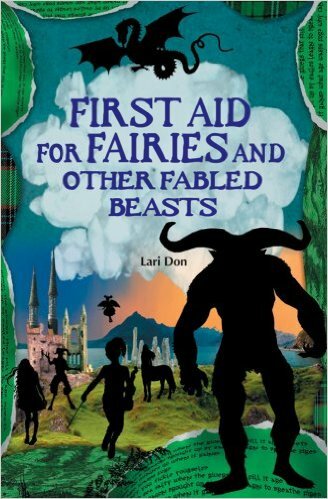 It is a fantasy adventure but introduces young readers to traditional Scottish mythological characters, and explores some of the Scottish countryside as well. And while Helen is surrounded by creatures of magic, she herself is solidly grounded in science and reality, heals based on the advice from books, and is usually the voice of reason and good sense. She's a good character for her young readers to relate to, because the choices she makes are so well-considered, and every decision comes with a lesson/consequence that isn't so heavy-handed that it will be ignored. On the publisher's website, the book is considered to be an 8-12 reader; but there is no reason to limit readership to an age-group. Consumers of good vs evil quest-style fairy tale and fantasy will find the unexpected on every page, and love this book regardless of age.